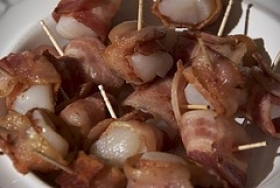 Have you made Bacon Scallops? 2. Arrange bacon slices on baking sheet. Bake until pale golden, about 8 minutes. 3. 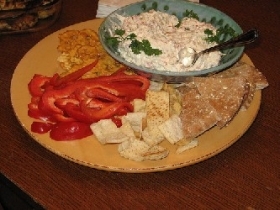 Cut each slice crosswise in half. Cool. 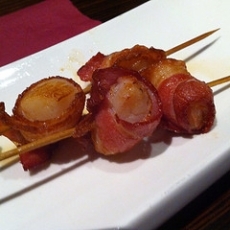 Wrap 1 bacon piece around sides of each scallop and secure with a toothpick. 4. Preheat oven to 400-degrees. 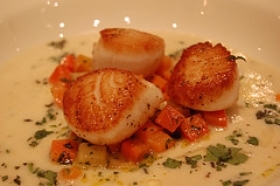 Place scallops on baking sheet and bake until cooked through, about 10 minutes. 5. Meanwhile, boil cream in heavy large skillet until reduced to 3/4 c.
6. , about 3 minutes. Add mustard and syrup and boil until thickened to sauce consistency, about 3 minutes. 7. Season to taste with salt and pepper. 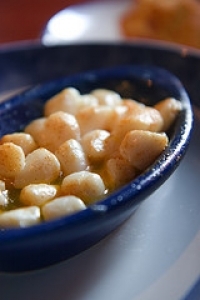 Remove toothpicks from scallops. 8. Spoon sauce evenly onto 4 small plates. 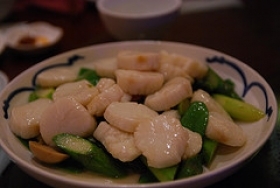 Arrange scallops decoratively atop sauce. 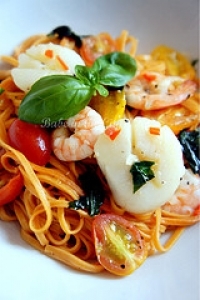 This recipe contains potential food allergens and will effect people with Shellfish, Mustard, Scallops, Beef allergies.